Glass is one of the world’s most prevalent and sustainable materials. It is both hard enough to use as building resources for our homes or offices and flexible enough to create inspiring works of art. Glass is in its molten state can be converted into any form or shape. This allows it to be dynamic, shifting to match the vision of the person shaping its form. Glass can be endlessly recycled and change shapes many times, making it a substance of infinite possibilities. South Africans are finding unique ways to build a legacy through glass, from spearheading the recycling industry, building a small community business and creating conceptual artwork that will inspire for years to come. 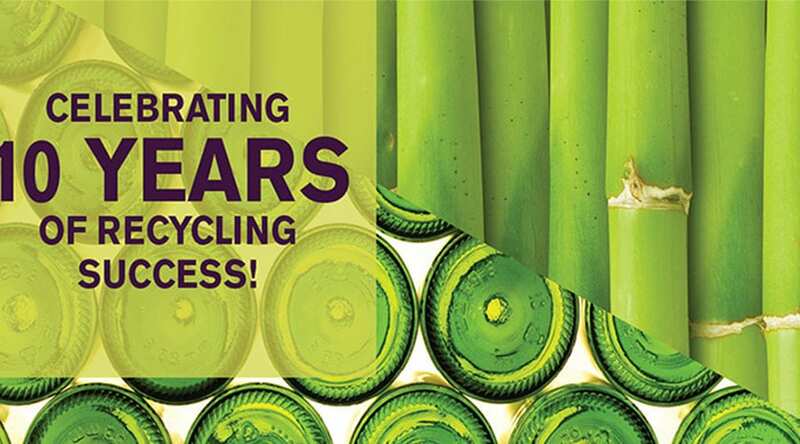 The Glass Recycling Company (TGRC) is proud to be celebrating 10 years of glass recycling success in South Africa. This anniversary marks a decade of sustainable glass recycling and glass reuse, a practice vital for all packaging. September is an appropriate time for celebrations as South Africa embarks on Glass Recycling Month. At the heart of TGRC exists the CEO’s commitment to safeguard the environment, help support small businesses and foster meaningful partnerships with Government as well as NGOs. As CEO, Shabeer Jhetam is proud of the company’s achievements and believes in its potential to continue to drive entrepreneurial development, job creation and environmental awareness. He believes “The greatest test of responsible packaging is its ability to be recycled. We continue to raise awareness of the benefits of glass recycling. Broadly speaking it reduces waste in landfills, has a positive impact on the environment and creates jobs. TGRC has changed the lives of 50 000 people, not to mention the extended effect it has on these individuals’ families. Jhetam says “this gives me great comfort as we have helped the lives of others through our work. Through glass recycling we are able to help these individuals develop a sense of responsibility and pride in what they are doing”. Team Square is a recycling buy back centre based in Tembisa, in the north of Johannesburg. Chris Msibi has been running the operation since 2006 and has ensured a far more efficient recycling system in the area. “Previously the trucks would arrive in Tembisa to collect recyclables, but no one knew when, or where these trucks would arrive.” This inconsistent collection schedule meant that recyclable glass would remain with community residents for weeks at a time, with residents fearful of leaving home for fear of missing the collection. Msibi’s team identified an opportunity and, equipped with recycling business knowledge from TGRC, Msibi began his recycling business. TGRC has supported his initiative by donating 10 skip bins which Msibi uses to store the collected glass ready to transported back to a glass manufacturer for recycling. The waste recycling legacy Msibi is building has created several opportunities for members of the community. “Community members know that if they bring recycled glass to me, they will be given money in exchange which they can use to buy food,” says Msibi. Previously many of his informal collectors may have gone without food, and now Msibi ensures that they at least earn an income through collecting and recycling glass. His largest base, interestingly enough, are elderly Tembisa residents. They use the money they receive from Team Square to buy food and put their grandchildren through school. The limitless possibilities created through glass recycling are evident in stories like Msibi’s. Beyond providing a livelihood, glass packaging positively impacts consumers through its purity and limited environmental impact, but beyond this, it inspires creativity through art. Local glass artist, Martli Jansen van Rensberg, has created a sustainable career as a glass-blowing artist. Jansen van Rensberg’s fascination is rooted in the physical process of making glass and its ability to mould into different abstract shapes. Despite glass-blowing being a niche vocation in the country, and the delicate nature of glass, she appreciates the limitlessness of her field and the versatility of working with glass. Here lies the beauty of glass, as an ever evolving substance, South Africans are finding unique ways to build a legacy through glass. Year-on-year, individuals and companies like TGRC use glass to make significant contributions to society while reducing waste and harm to the environment.